EXCHANGE programs between USC Fraser Coast and a leading Chinese university could be on the horizon if the council's Sister City relationship comes to fruition. 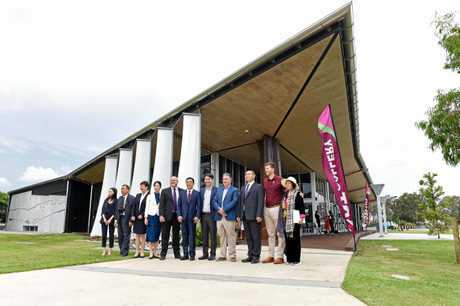 A delegation from the Leshan Normal University in China stopped in Hervey Bay as part of an official tour of USC campuses in the Wide Bay region, meeting with university officials and the Fraser Coast Regional Council. It comes two months after Fraser Coast mayor George Seymour and council officials visited Leshan for the Sichuan International Travel Expo. Professor Hu Dan, president of Leshan Normal University said the delegation enjoyed meeting the people and seeing parts of Hervey Bay during their stay. "We have enjoyed many discussions on collaborating with the council in tourism and education areas and a partnership will be possible if we work together," Prof Hu said. Cr Seymour said there was potential to have Chinese students joining the Fraser Coast community because of the Sister City relationship.